Evidently most of the digital cameras with semiconductor imaging sensors, so-called solid state cameras (in contrast to bulb or film based ones) are single-chip camera systems. This is the reason for the lower light sensitivity of color cameras. Because compared with the naked black-and-white (better: monochrome) version the surface of the according color sensor is coated with a Red-Green-Blue (short: RGB) layer. And this swallows about 50% intensity. Often even much more, because for correct color separation and for sufficient modulation range (dynamic) the near infrared (NIR, near IR) part of the spectrum must be suppressed by an additional IR-cut filter (also IR-stop filter) up to about 1.1 micron wave-length. The reason is the transparency of the color mask for light with longer wave-length and especially in this spectral range the sensors are rather efficient. Filterless black-and-white cameras could easily be used as cheap substitutes for night goggles. Effected by the color filter coating of the sensor in stripe or mosaic pattern an additional disadvantage arises: In a black-and-white sensor each light sensitive cell contributes to the resolution directly. Each single cell can cover a tint by its gray scale value between black and white, thus each single cell represents one pixel (= picture element). A color sensor of the same quantity of cells needs one red, one (or two) green and one blue masked cell to represent a tint. Thus each pixel consists of a RGB sub-pixel triplet of three cells. Just arithmetical the resolution in relation to the quantity of cells is reduced to one third only. These facts are held back when talking about resolution and the quantity of cells is told to be equal with the quantity of pixels. However, through complex algorithms the loss in resolution caused by the color coating can be enhanced even in real time. Nevertheless, hardly more than 2/3 resolution of the according black-and-white sensor is achieved. The images on the left show parts of color filters. Each cell represents a (sub) pixel. The twice as much green cells are used to enhance the resolution due to human perception capabilities (middle of the spectrum; sensitivity). The electronics for control and address circuits are usually placed in the black, here only thin drawn pixel outlines. Depending on the type of sensor such a blind area then can reach and even surpass the area of the valid active pixel. This ratio active to passive sensor area is named fill factor. In general mosaic filters offer a higher resolution than stripe filters, the color interpolation, however, is more complex. Therefore the pixel count is not the main issue. At best it is as evident as the processor clock as sole criterion of PC efficiency. What matters is also contrast, sensitivity, dynamics, color separation and many more. A megapixel monster with slack images just inflates memory demands with a lot of useless data in the end. Besides more pixels per square means smaller cell sizes paired with reduced sensitivity and increased noise tendency. Color seams appear even in black and white images. In this context one can just check what camera and sensor suppliers expect what number of defective pixels their customers have to tolerate. Usually one does not see them, because they are »mapped« by using the interpolated values of pixels in their neighborhood. Concerning quality suppliers one has to search for them, whereas others force sensors with dozens and dozens of faults upon you. There are various color filter patterns and arrangements, not only stripe and Bayer pattern. Usually this coating is done by photo lithography. Also one finds other color sets than RGB, e.g. magenta instead of red and yellow instead of blue or two different shades of green. Also additional non-coated pixels can be integrated in the matrix and so on. In fact each electronic color camera gains its images by interpolation, because there is no colored current. (Not even from Yello. ;-). Because the color algorithm knows the corresponding filter color above each individual grayscale cell it is able to calculate the color at this location. As a rule several neighboring cells are used for the calculation. Just to mention: Expensive three-chip cameras (also named 3 CCD) as used in standard video applications, however, have a uniform masked red, green and blue sensor for each color channel. The beam split is done by a prism arrangement. In the meantime for still cameras there are also sensors (by Foveon) with vertical instead of lateral structure, i.e. one uses the dependence between penetration depth and wave-length of the light to separate the colors. If the application is not pressed for time one can use color filters or color wheels similar to those which are common sight with professional spotlights. Some studio still cameras shoot so three successive photos each with a different color filter in front of the sensor or lens. Effects of filters are responsible for color artifacts at edges or lattices. If the image on the sensor is about the same size as its filter grid or its cell structure, resp., moiré and aliasing effects will possibly be the result. Good to visualize by error colors in shots of venetian blinds or fan grills. Just make a survey with your camera. Also the effect is well-known when scanning screened newspaper photos. Here on principle the Nyquist-Shannon-Kotelnikov theorem is valid. One can easily check it: When one shoots e.g. a white (or gray) fence, the image of each slat will have to cover at least one row of red, green and blue pixels otherwise the white tint cannot be mixed. It is created when all color channels are illuminated with the same intensity. Moiré will occurs, when two grids in the optical path are shifted to each other, especially distorted. Then wide, format filling streaks occur with their numbers and directions depending of the angular position between them. This could even happen to human eyes: Just lie two finely woven fly screens over each other and slowly change rotation angle between them. Because each pixel provides a different dark current (i.e. does not necessarily show »0« when not exposed), below a certain threshold level one makes the camera electronics set all pixels to black by force. Otherwise one would find scattered colored pixels in a dark area. That limits dynamic and leads to an effect called »drown in black« - dark surfaces and shadow areas show no structures, inhomogeneities are wiped-out. In the beginning a major part of digital cameras suffer from this typical deficiency. Currently especially (cheap) CMOS cameras and notably those with small pixel sizes are affected. One has even tried to use sensors with not regularly but randomly arranged color pixels, which means without fix scheme for positioning the single RGB color filters. While for the color separation by penetration depth the angular depending path length and stochastic effects cause errors. Even three-chip cameras can show colored lines, speckles or wedges when beam splitting prisms are not well adjusted or separated or under intensive illumination. Rotating color wheels can cause unstable brightness and wrong colors when transmission differs or synchronicity is not perfect. The characteristics of CCD sensors are well given by the bare silicon curve. CMOS sensors show a wider maximum pushed expanded to shorter wave-length due to their flatter structures supporting the reduced penetration depth of light with smaller wave-length. The figure below shows the spectral sensitivity of the three RGB channels of a accordingly masked (= coated with red-green-blue filter pattern) color CMOS sensor. One clearly perceives the transparency of the polymer in the red and especially in the IR region and caused by that the demand to attenuate or respectively to block this part of the spectrum, in order to avoid overstress of red and to reduce noise, wrong level and overdriving. When using color sensors one can manipulate this within certain margins by selecting transmission specifications of the color filter pattern and the arithmetical weighting of the color channels. Additional color conversion filters (reduction of sensitivity in red; for color video cameras often made of bluish glass) help here, too. In the short wave-length region of the spectrum (UV, blue) the sensors are comparatively insensitive. Besides here the glasses add further restrictions. The spectral sensitivity of a camera, however, is not only limited by the sensor or the film and the filters, but also by the optics, especially lenses and the IR-cut filters mentioned above. Because using the full spectral sensitivity can lead to dull or blurred images. Due to focal length is a function of wave-length, the single color images arise in different distances to the lens (chromatic aberration). Achromats (lens systems in layer structure) help to avoid this effect. with the refraction index n of the lens material in air (nair ≡ 1). Thus about 8% to 10% per transmission through a glass plane. Sometimes one happens to discover that by the iridescent colored surfaces when light incidents diagonally because ΔR is a weak function of the angle of incidence. By the way: The transmission of standard lens glass badly decreases with wave-lengths of 320 nanometers and less. In the long wave section the drop lies far away from what a sensor made of silicon perceives. Just to mention the coating layer of a sensor is made of quartz glass (silicon di-oxide). It is covered by a thin layer of silicon nitride. If one wants to make shots in another region of the spectrum, one has to use different sensor and even lens materials. For instance IR cameras and especially thermographic cameras, which work in the wave length region to 3 micrometer and above, partly use sensors made of Indium-Gallium-Arsenide (InGaAs). Each of both present solid state sensor technologies CCD (Charge Coupled Device) and CMOS (Complementary Metal Oxide Semiconductor) are designed with silicon as raw material. Their advantages and disadvantages depend on their basic functions. They use the inner photoelectric effect - in both the pixel work like an array of solar cells panels on the rooftop or in a meadow: one pixel = one solar cell, more light = more charge or current, resp. The image on the left shows the basic principles of a CCD cell in comparison with a CMOS cell. The charge generated in a CCD cell by incident light is directly read out from each cell. 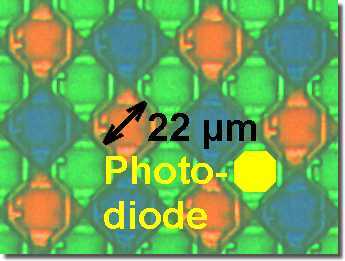 This charges are moved step by step outside of the photoactive area. Outside they are analogue/digital converted and amplified, resp. In the CMOS cell the incident light generates a photo current proportional to its intensity in each cell and decreases the reverse resistance of each photo diode. These reverse currents through the photodiodes (i.e. the generated charges) are processed. The cells of a CCD sensor operate as exposition meters accumulating charge and are read out in certain intervals. The fast CCD sensors exist in three types: FT ((Full) Frame Transfer), ILT (Interline Transfer) and FIT (Frame Interline Transfer). For still photography the full frame principle is sufficient enough: The charges remain in the active area until read-out shaded by a central mechanical shutter. In FTs the complete frame is moved through the photo active cells in a separate light shielded area and then it is processed. Due to the different structures often it is possible to identify both regions by one's naked eyes. ILTs show alternating photosensitive and read-out lines. The charge of each photoelectric cell is directly pushed to the according light shielded neighboring cell and this line is then read-out. FITs are a combination of both designs. FTs reach a fill factor of almost 100%, but suffer of a second exposure during the read-out phase (so-called smear). ILTs and FITs show a reduced fill factor, but are less sensitive in read-out phase. The expression fill factor gives the ratio between optical sensitive area and area occupied by addressing circuits of each cell. Thus it allows to compare sensitivity under the precondition, however, using the same basic technology. The cell structure and wiring are rather similar to the layout of a DRAM, and so experimental shots were already made with opened memory circuits. A PPS (Passive Pixel Sensor) operates like a CCD ILT. By illumination caused charges generated in a photo sensitive cell, mainly a photo diode, are read out cell by cell directly and are amplified and analogue/digital converted outside the photoactive area. Common nowadays is the APS principle. (Active Pixel Sensor. The acronym has nothing to do with the APS-C format.) Here photo sensitive cells just work with the indirect principle of a CCD sensor: The exposure of a photo diode controls the connection to the operating voltage Vcc using a CMOS transistor (amplifier). Each cell just has its integrated amplifier circuit. Because illumination reduces the charge over the photocell one can compare it with the negative film inside a camera. The figure on the left shows the structure of a CMOS APS cell. Description of one cycle: Over the reset switch a pre-charge is brought in. After that the switch opens again and over the photo diode D related to illumination charge floats off. With that the control voltage at the amplifier T changes and with it the voltage V. Using the optional switch t shutter (if available) one can interrupt the discharge process, then the capacitor C controls the amplifier all alone. The pre-charge (realized by the reset switch) each time during exposure reduced by the photo diode is the reason for CMOS APS being insensitive to saturation effects unlike CCD sensors. More than complete discharge is not possible. The simplest cell is made of three transistors, namely the switch for the initiation before starting the frame/exposure (reset), the switch for read-out process (read) and the real amplifier (T). This circuit offers a rolling shutter only. If one adds some kind of sample and hold circuit (t shutter and capacitor C) in the amplifier control one will get a global shutter. This is an electronic shutter operating on the whole sensor at one given time and not only line by line like the rolling shutter. With more transistors one receives additional opportunities for controlling and improving the signal quality. Thus using a 5 or 6 transistor cell one can decouple recording and read-out, so already start recording or exposure, resp. again during the read-out process is still running. are several times more sensitive to light - in positive as in negative manner. One could shoot with less illumination, but the sensors are sensitive to overexposure. Thus very bright regions show flare-shaped extinction (blooming) in the neighborhood which can cover the complete frame; high irradiation during read-out phase can lead to some kind of double exposure (smear). are only well done by specialized semiconductor manufacturers. With increasing number of pixels there is a dramatic yield decrease, because due to the basic function, especially in FT sensors, the optical active regions are used as wire during the read out phase. A defect cell can paralyze a complete line or column. Then the sensor is not to use. are more noisy because of their not homogenous structure and show similar problems as flat panel displays. Some error pixels may occur which will be computed away then. One has to put emphasis on the image processing (among others masking defective pixels so-called mapping). Each pixel is adjusted individually (gain/offset settings). come from the much more present technology. Assuming a sufficient quantity they are significant cheaper. Besides read out is made with additional lines, thus a defective pixel can be interpolated by its neighbor pixels and does not ruin the sensor. offer the possibility to integrate additional circuits or signal pre-processing on the same chip in order to shrink the camera and to increase flexibility; the more or less random access to the single cells makes possible e.g. the preselection of a window, so called sub sampling, windowing, ROI (region of interest) or AOI (area of interest). Also image processing for trigger events (in frame trigger) or a second exposure run in each frame are comparatively easy to realize. Evidently still many of the photo and surveillance cameras use CCD sensors while it is not possible to imagine up-to date photo and video cameras without CMOS sensors. In mobile phones with camera function CMOS sensors are used almost exclusively. The trend moves to CMOS technology, to the camera-on-a-chip. In high-end cameras temporarily one has sometimes tended towards low integration yet to optimize each part like analogue, digital electronics, control, power supply, ... individually. In standard use hardly one technique shows an advantage. In noise critical special applications, however, the CCD sensors lie in front. Cooled, if necessary. For shots against illumination sources and possible overexposure effects (shiny surfaces, ...) CMOS sensors may be the better choice. By the way: The often made assertion CCD sensors are in principle slower than CMOS sensors is not true so far, because there are CCD high-speed camera sensors available as well, refer e.g. to the sensors of Dalsa or EG& Reticon. Images on the upper right: Silicon die without housing, about 20 mm x 15 mm x 0.5 mm in 0.5 micron technology. The greenish area is the mosaic filter. In the framing dark border one recognizes 137 small squares, so-called bond lands or pads, for the later electrical contacting with bond wires. Image on the lower right: 1 000 times detail magnification out of the filter matrix of the CMOS sensor. The light sensitive area of the photo cell, marked yellow in the image, shows with 11 microns half of the cell size of 22 microns. The chessboard pattern tilt by 45° built with honeycomb cells like Fuji and Sony successfully use it in their »Super-CCD« and »ClearVid« arrangement resp. allows a higher resolution especially of vertical and horizontal structures compared with the standard Bayer pattern. Also according high-speed cameras this change was obvious. Whereas typical systems of the 1990s still used modified CCD sensors in general, systems since the end of the 1990s mostly operated with CMOS sensors. Nevertheless CCD sensor systems exist further on. Well known high-speed camera sensor sources are Dalsa/Teledyne (Canada), EG&G Reticon (USA), Fillfactory/Cypress (Belgium), Photobit/Micron/Aptina (USA) or CSEM (Switzerland). Everything counts in large amounts. Because of a fill factor, i.e. the ratio photoactive area to control electronics area, smaller than one area and therefore sensitivity is lost. The structure of CMOS sensors makes it worth to try microlenses in order to compensate this lost at least partly. The lenses should transport the light falling on the blind sticks to the light sensitive parts of each cell. Especially one like to use them for very small cell structures and fill factors (10 micrometers per square cell size and 30% fill factor and less). The lenses are directly deposit on the sensor surface by photo lithography. Due to the small size of the lenses, diameter a few hundredths millimeters each, and the large quantity - one lens for each cell (= pixel) - it is a certain endeavor and the optical qualities and the uniformity are not quite improved. This causes an under-proportional increase of sensitivity. The price is higher expense and possibly reduced image quality due to optical faults and other parasitic effects. Therefore the idea to grind the sensor bottom and then to put the sensor die upside down. The supply electronics are at the bottom, the middle is filled by photocells and on the upper side color filter pattern and perhaps microlenses are placed. The gap between CMOS standard designs and sensor demands can be reduced by that, what makes the sensors cheaper especially by integrating further electronics and conceals deficiencies like e.g. the meanwhile not deep enough p/n junction layer position for the penetration depth of light beams. Not really a quite simple semiconductor process (among other massive grinding of the wafer is necessary), but similar technique was used with special CCD sensors, too. 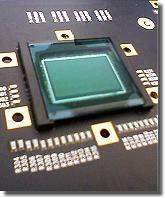 Some rare photo cameras make use of stacked chips, the sensor IC lies on top of the memory IC. Often, however, the sensors are produced in technology families with bigger structure widths than that of present DRAMs or processors. This is especially valid concerning high quality cameras. Enhancement by combining the best of both worlds, bridging the gap between CMOS and CCD. Contrary to cameras for the mass market the pixel count for cameras used with technical and scientific applications is not the sole criteria. One rather tries to define for these areas of applications (e.g. microscopy) an optimal combination of resolution, dynamic, speed, ... Especially one aspires to improve sensitivity and noise suppression of the CMOS circuit design with photo cells as large as possible and with extra designed-in sophisticated analogue/digital converters on pixel and line or column level. That requires area, of course, so (at least) early sensor designs just provided a rolling shutter. The global shutter so essential for high-speed videos could just be missing sometimes. Meanwhile even fast BSI sCMOS sensors are available. Within a mount family there are not such problems. All adequate lenses show the same flange-back, thus each image is displayed at the same location. The only difference is the varied size of the circular images the lenses offer at the image plane. Given is the format of the sensor that is illuminated sufficient enough and without too strong optical distortions. If the sensor completely lies inside this image circle, everything will be all right. If it is larger, the shot images will be considerable sharp, but their corners tend to be underexposed (keyhole effect, vignetting). Thus especially one can usually select without problems C-mount lenses of larger formats for a C-mount camera with a smaller one, e.g. an 1 inch lens on a 2/3 inch camera. In the other way, however, with restrictions only, refer to sensor C in the figure on the left. The figure on the left shows the crop factor, also named focal length extension. This is in fact a pseudo effect, because focal length is an invariable attribute of each lens. How could the lens ever know which sensor is operated? The different image impression, especially the angle of view (also field of view), is only caused by showing the image of a smaller sensor (B) with a greater magnification on a screen or a print. Its pixels lie closer to each other than those of a bigger one (A) and are displayed somehow stretched, nevertheless without negative effects on quality. Adequate resolution (pixel count) assumed. At least the sensor must lie inside the image circle of the lens, given as format, otherwise vignetting takes place (C). If one compares two format filling images of an object, e.g. one of a C-mount camera with a 2/3 inch sensor and one with an 1 inch sensor, usually one will not see a difference. Displayed on the monitor screen they are of the same size. But due to the fact that they come from areas of different sensor sizes, the magnification must be smaller on the smaller sensor (here B), in order to make the image fit to it. Therefore the same »XY Millimeter« lens in front of a larger sensor (here A) will work at a camera with smaller sensor like one with a larger focal length and vice versa. If, however, one compares the shots based on the angles of view (= what fits onto the respective sensor using the same lens) only. So far focal length and image format belong together and give the imaging scale. The image circle, however, is a lens parameter only. And the focal length, too. The value (about 1.5 ... 2 comparing typical digital SLR cameras with miniature 35 mm; format cameras of 24 mm x 36 mm and thus 43.3 mm diagonal; therefore sometimes the expression »XY mm 35 mm format equivalent«) states the apparent increase of the focal length finally due to the decreased sensor diagonal. Thus the expression »crop« meets the facts better. Much of the image just misses the smaller sensor. One will see the center only and will interpret this as tele/zoom effect, when the monitor is displaying the sensor full screen, refer to the figure above. Hooked on high quality demands one has to take into consideration, however, that the area with optimal corrected lens errors is smaller than the maximum illuminated one and that smaller formats claim lenses of better qualities because of the higher pixel density. Besides one needn't spoil the image quality of a good camera by using just a better bottom of a bottle instead of a lens. Then the image remains sharp to the corners. In professional still imaging widespread use of the according possibilities is made. If the focal length of a lens is of about the same value as the diameter of the format, one will often call it the »normal lens« for this format. Concerning miniature or 35 mm cameras this would be about 50 mm ±5 mm, refer to next chapter and [SloMo Tips]. Then the (sharp) angle of view equals that of humans roundabout. although in real one inch measures 25.4 mm. Entrance for light: The aperture or f-stop reduces the incident light intensity falling on the sensor or film. The f-stop number is defined as k = focal length / effective opening diameter. On the f-stop adjustment ring one finds the f-stops inscription as multiples of the square root of 2 (1.4 - 2 - 2.8 - 4 - 5.6 - 8 - 11 - 16 - 22 - 32 - ...). With increasing f-stops the intensity let through is reduced in a way that one receives half of the intensity from step to step. The reciprocal of the smallest f-stop is often called »transmission/light strength«. But if one wants two lenses offering the same brightness, one will have to take two with identical t-stops, defined as t = 10 × f-stop / √ transmission [in %], as it is usually provided by lenses for movie cameras. When using a sensor with the same size a smaller aperture diameter (= high f-stop number) enlarges the depth of view, refer to [SloMo Tips]. Expression zoom stands for lenses, which permit to tear closer an object by using a stepless focal length increase within a certain range of given focal length. Usually they are large, heavy, expensive and of poor light sensitivity. One should prefer to use exchangeable lenses of different but fixed focal length. There are available real zoom lenses where the image stays sharp during zooming and vario lenses where one can change the focal length, too, but has to adjust focus as well. »Digital zoom« or »electronic zoom« stands for an enlargement of a part of an image by means of a (simple) imaging program. High zoom levels cause pixeled images. Normally electronic zoom is not a worthy substitute of an appropriate zoom lens, even if marketing likes to claim it so. By the way, similar case: »5x zoom« does not say anything about the magnification of a lens, but merely that its smallest adjustable focal length is five times smaller than its biggest. To call such lenses telecentric, however, is wrong. This type of special lenses images an object in the same size disregarding its distance. 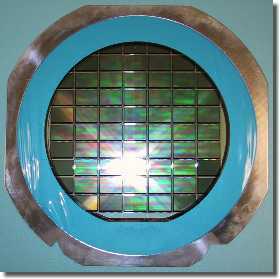 These optics are especially used in image processing for measurement applications. For instance when one views in a tube it does not become narrower with increasing distance, but it looks like a ring washer and it is no problem to measure the inner diameter and the thickness of the wall. Used with an usual landscape scenery strange effect may occur, e.g. roads running to the horizon do not get smaller. When talking about resolution it is highly recommended to get an idea of the modulation transfer function MTF, find an excellent explanation e.g. at how to read optical data sheets of Schneider-Kreuznach. with the refraction index n and the thickness d of the plate (nair ≡ 1). With a glass plate the image would appear about 1/3 of its thickness behind the sensor, due to the increase of the effective flange-back. A mechanical solution must be designed in order to adjust this certain additional distance between lens and camera body, exact the sensor. Therefore the threaded pins or special mechanics, resp. in the lens adapters e.g. for cameras prepared for optionally mounting an internal LC shutter or an additional internal (IR-cut) filter or which are designed for IR shots.